Yesterday I spoke with someone that was so instrumental in my life. She is the mother of one of my very best high school friends. Her house was the place we all went to hangout, eat dinner and just sit on the couch and chat. It was always a fun place because it was the house of 5 girls. Yes, this wonderful woman is the mother of 5 amazing girls. Just imagine the wave of hormones when puberty hit!!! But, Shirley, which is what we call her, was always there and always welcomed you. My friend Kimmie and I would go over there even if our partner in crime, Sissy was not around. Shirley kept the kitchen well stocked and we had many a snack and late night chuckle with her. So all of us grew up. Shirley moved to Florida, re-married her high school sweetheart and I still try my best to end up at her house for a night of snacking and laughter. I was so lucky to do so a few years ago with husband and 3 children in tow. My children commented “they feel like family” and “you and Sissy act like you are sisters.” Well, that is the truth. And that is the gift of this special family that I snuck into years ago in Birmingham, Alabama. Well, Shirley keeps following Healing Knots and is so proud of all that we are doing and making. 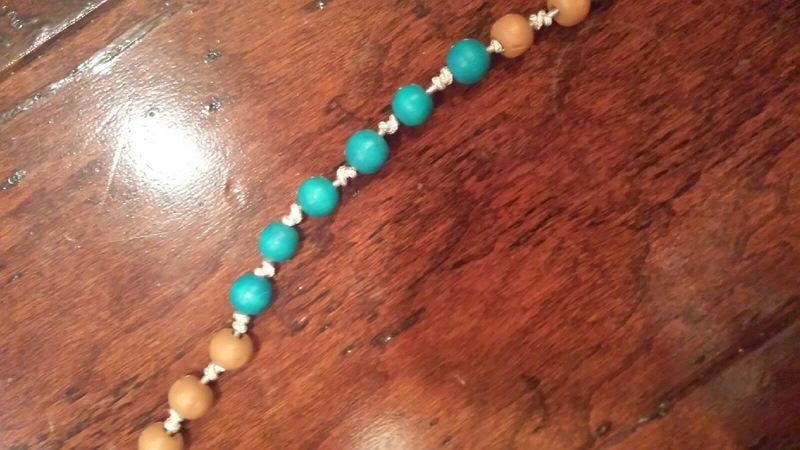 We spoke yesterday because she wants Christmas presents for her daughters…bracelets for all 5 girls that have the 5 sister beads and one for the mother!!! To remind each of them that they are always connected to each other even though they live in Colorado, Florida and Alabama. 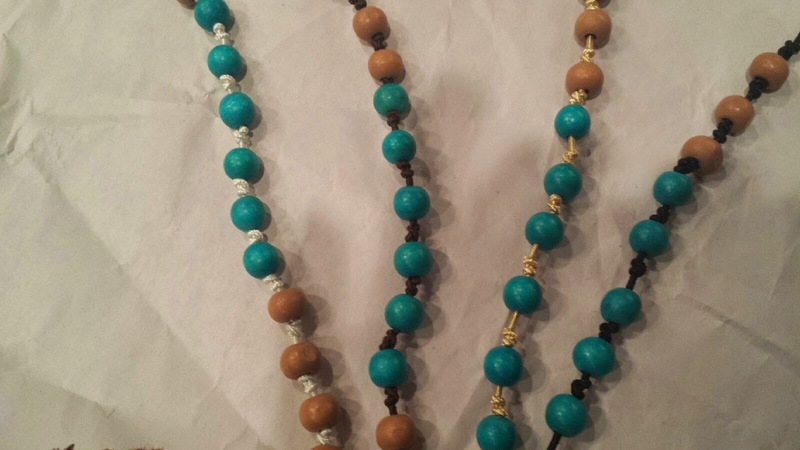 6 Turquoise beads in a row to remind these 6 amazing women of their bond of love and support. Remembering that you are “Knot” alone is something we all need. Turquoise, a blend of the color blue and the color green, has some of the same cool and calming attributes. The color turquoise is associated with meanings of refreshing, feminine, calming, sophisticated, energy, wisdom, serenity, wholeness, creativity, emotional balance, good luck, spiritual grounding, friendship, love, joy, tranquility, patience, intuition, and loyalty. I am so excited to make this Christmas order….6 amazing women that will all be connected with a bracelet of their own!!!! I will send pictures of them all…It will warm your heart!!! Who do you want to connect with this holiday season….would a bracelet help remind you of your love and connection with that special person even when miles keep you from being together? Do you have a special color that would embody the feelings of love and support you would like to share with someone? Just a thought on this December morning.